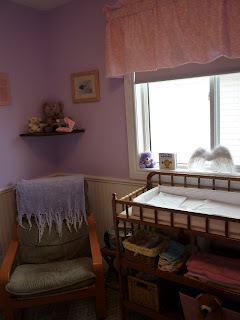 We have put the finishing touches on Madison's Nursery.... here are some highlights.. 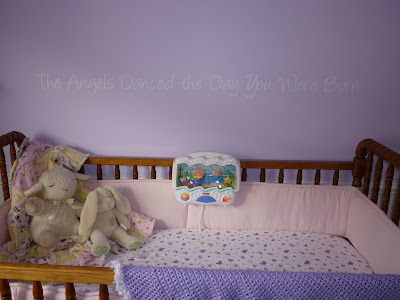 Above her crib reads "The Angels Danced The Day You Were Born..." How perfect is that? 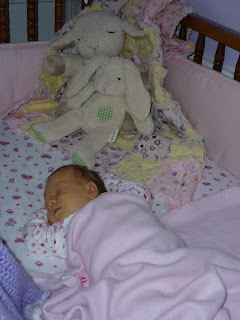 First nap in her crib..
She is adorable, as always! I LOVE LOVE LOVE the shade of purple on her walls, and the quote above her bed. Perfect. It's perfect in every way Lea. Everything is perfect just like her. Looks great and she is so beautiful. I love the saying on the wall. So pretty! I love the saying! Beautiful. I adore the purple. 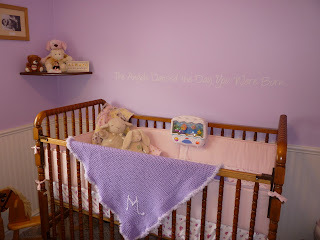 So perfect...I love that you put the saying right above her crib. 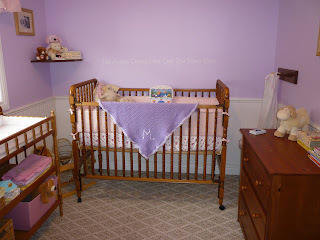 I love your crib...we are going to get that crib set in white! Just beautiful, Lea. Little Miss is so cute! I love the purple color and the saying!